There’s Two Chances Left to Qualify for The Harris Family Furniture Sealy Kelburn 2 Queen Mattress Set! You now only have two chances left to qualify for the Harris Family Furniture Sealy Kelburn 2 Queen Mattress Set! Gino and The Magic Morning Show have been taking qualifiers all week and on Friday (12/07) the Grand Prize winner will be announced. Today on the Magic Morning Show, Gino talked with Harris Family Furniture‘s Will Harris and not only discussed the Sealy Kelburn 2 Queen Mattress Set, but also what we can expect from Harris Family Furniture this holiday season and beyond. Check out the interview below! 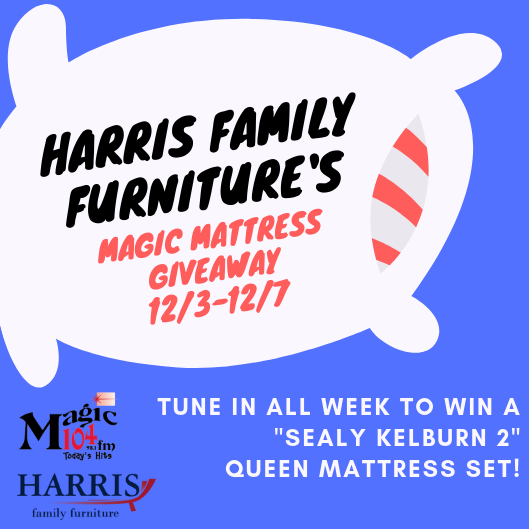 Your next chance to qualify for the Sealy Kelburn 2 Queen Mattress Set and win a $25 Harris Family Furniture Gift Certificate will be tomorrow (12/06) on the Magic Morning Show at 7:40am and on our Facebook Page! Good luck!